Enjoy Inspiring Oceanfront Views and Dazzling Sunsets – Framed by the Islands of Molokai and Lanai – as the Sound of the Crashing Surf beckons your Call from the Privacy of your Own Vacation Condo at the award-winning Mahana . . . Just Steps to the Sand! Beachfront Elegance awaits your Vacation Pleasure . 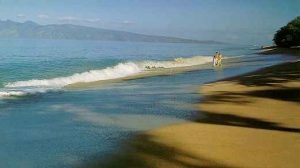 . . in a Private and Tranquil Setting on the Golden Sands of World-Famous Kaanapali Beach. Lounge in Comfort & Style from the Privacy of your own Oceanfront Studio, 1-Bedroom or Spacious 2-Bedroom Maui Vacation Condo Rental, while toasting another Sunset from your own Private Lanai…Featuring Magnificent Ocean Vistas of the Sparking Emerald-Blue Pacific, framed by Swaying Coco Palms. While sipping your favorite Tropical Drink, the Trade Winds will Gently Caress all your Senses, with the sound of the Waves lapping at your Door. 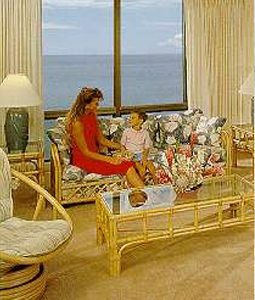 You’ll be surrounded in Casual Elegance from your Beautifully Furnished Condominium Suite, accented in a Tropical-Rattan motif. Appointments feature Fully-Equipped Kitchens with Micros, In-Suite Washer/Dryers, Cable TV and VCR’s. When it’s time to adjourn, you’ll be pampered in your own Oceanfront Master Bedroom Suite (most units) and adjoining Lanai, with the sound of the Surf gently lulling you to sleep. 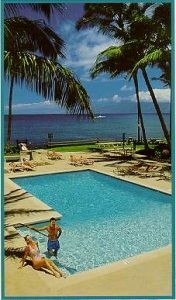 Your Tropical Paradise Maui Vacation Resort Getaway Features your Choice of All Oceanfront Condominium Suites. Choose from Intimate Studios that are Perfect for 2; Roomy 1-Bedroom Oceanfront Residences that accommodate up to 4 guests; or Spacious 2-Bedroom/2-Bath Vacation Condo Rentals – Showcasing Oceanfront Master Bedrooms and Adjoining Lanais – that Sleep up to 6. All Linens and Towels Provided.